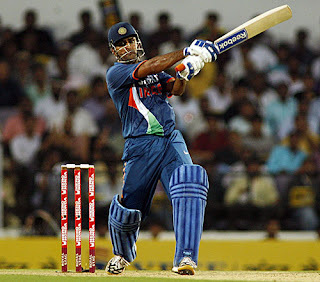 Mahendra Singh Dhoni, captain of India hit a brilliant century to win the game for his side. He hit a splendid 124 off 107 balls and had two excellent partnerships, first with Gautam Gambhir (76 off 80 balls, 6 fours) and then with Suresh Raina (62 off 50 balls, 6 fours 1 six). It was all started with Ricky Ponting won the toss and elected to bowl first. Virender Sehwag (40 runs off 31 balls, 6 fours 1 six) smashed Aussie bowlers all over the park, however Sachin Tendulkar missed out today, as he scored just 4. Sehwag then joined hands with Gautam Gambhir and they took the score to 67. Here, Sehwag gave a catch off the bowling of Mitchell Johnson. The returning Yuvraj Singh came and started hitting strokes all over the park. 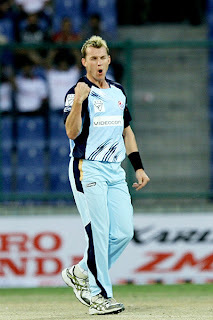 But his stint was short lived, as he scored run-a-ball 24 and was caught by Peter Siddle off his own bowling. Then came the ‘Captain Cool’. He started taking quick singles, hit the odd boundary and along with Gambhir, he took the score to 216. This partnership witnessed the fifties of Gambhir and Dhoni. Dhoni and Gambhir hit the Aussies to all corners of the ground. With a confusion between both of them, Gambhir’s innings ended with a direct hit. Gambhir made 76 runs off 80 balls, with 6 fours. Once Gambhir departed, Dhoni attacked the Aussie bowlers even more fiercely; his partner was Suresh Raina. Raina also supported his captain with some lusty blows. Both of them added 136 runs off 93 balls. Raina’s fifty came in just 42 balls. Dhoni completed yet another ODI hundred in style by hitting Shane Watson for a big six. He hit one more six on the very next balls. His century came off just 94 balls, as he finished on 124 runs off just 107 balls. India finished on 357-7 off their 50 overs. With Dhoni’s century, it was the first century by an Indian captain against Australia. Mitchell Johnson took 75-3. In reply, Australia started in a similar fashion and soon lost the wicket of Tim Paine, when he was dismissed off the bowling of Praveen Kumar. Shane Watson and captain Ricky Ponting took the innings from there, but were never able to cope with the rising run rate. Soon, Watson perished off the bowling of Ishant Sharma. Soon, Praveen Kumar dismissed Ricky Ponting and Australia slipped further down. Within a few overs, it was clear that Australia would not be winning this match. Indian spinners, especially Yuvraj Singh and Ravinder Jadeja bowled well and never allowed the Aussie batsmen took the upper hand. Michael Husey was the highest scorer for Australia, as he scored 53. Ravinder Jadeja took 3 wickets for 39 runs. Ashish Nehra took 2 wickets, so did Ishant Sharma. Indian Captain was the obvious choice for the Man of the Match award. With this victory, India level the series 1-1 and would be keen to win the third game and take 2-1 lead in the series. four run defeat against Australia in the first match of the seven One Day Internationals series on Sunday. At 201-7 in their chase of a 293-run victory target, India seemed heading for a comprehensive defeat before Praveen (40 not out) and Harbhajan (49) came up with a defiant 84-run stand off just 57 balls for the eighth wicket (an Indian record) that took them to the doors of victory. Earlier, Australia set up a victory target of 292 runs. Tim Paine, Michael Hussey and captain Ricky Ponting played splendidly to set up this huge score. Ashish Nehra took 2 Aussie wickets, whereas Ishant Sharma looked in good form after a long time and he ended up taking 3 Aussie wickets. For India, top order batsmen like Sachin Tendulkar and Virender Sehwag failed badly, however, Gautam Gambhir showed what a gutsy cricketer he is. He hanged on for 85 deliveries and scored an important half century. He scored 68 with 6 fours and 1 six. There were useful contributions from Virat Kohli and the skipper MS Dhoni, but with the wicket of Ravinder Jadeja, India were reduced to 201-7 in 40 overs. It looked like as if the match will have a one sided end. But Praveen Kumar and Harbhajan Singh have other plans. They played smart cricket and Bhajji showed his 'liking' for Aussie bowling once again with a brilliant innings of 49 runs off just 31 balls with 4 fours and 3 big sixes, whereas Praveen Kumar justified his batting talent and he remained unbeaten on 40 off just 32 balls with 5 fours and 1 six. If India would have won the game, the Man of the Match would certainly had been Harbhajan Singh, but with the Aussies winning it, Michael Hussey was adjudged the Man of the Match for his brilliant 74 off 54 balls with 8 fours and 1 six. What a series opener it was? I can't wait for the second match which is scheduled to held at Nagpur's Vidharbh Cricket Association ground on Wednesday, Oct 28. A compelling performance from Brett Lee, with bat and ball, spurred New South Wales to the Champions League Twenty20 title in the final against Trinidad & Tobago in Hyderabad. Lee scored 48 to lift NSW from 83 for 6 to a competitive 159. He then returned for a fiery spell with the new ball, taking 2 for 10 off two overs, before symbolically ending the T&T challenging by catching the fearsome Kieron Pollard on the boundary. NSW also had another, if less prominent, performer in young legspinner Steven Smith. He partnered Lee during a 49-run partnership, scoring 33, and picked up two crucial wickets with his legbreaks. The question at the start of the battle for the biggest cash prize in a cricket tournament ever was that who will handle the pressure of the final better? Trinidad & Tobago came out on the top initially, reducing New South Wales to 83 for 6, but Brett Lee played a superb hand to propel NSW to a competitive 159 in Hyderabad. Lee is a clean hitter but his innings wasn't a blind counterattack in the traditional sense of the word. He started slowly, reaching 7 off 13 deliveries, before he broke free in the 16th over against Lendl Simmons. The first delivery, a full toss, was swung over square-leg for a six, the fourth delivery was a clean hit over long-on, and the last one was carved to the cover boundary. Time and again, Lee cleared the front leg and swung cleanly through the line. Navin Stewart disappeared over long-on and Sherwin Ganga was heaved over midwicket as Lee powered NSW to a good total. Lee got support from Steven Smith, who did what was required perfectly: give the strike to Lee, and try to pinch the occasional boundary to soak up the pressure. Until Lee delivered his counter punch, though, it was T&T all the way. Simon Katich wanted to bat and Daren Ganga wanted to bowl and both teams got what they wanted out of the toss. The question then was, considering T&T's ability to chase down big scores, would the pressure to set up a daunting target tell on NSW? The answer played out during the next twenty overs. If NSW were to get to a huge total, the two hard-hitting openers had to contribute heavily but that didn't happen. T&T started with the spin-seam combination and Sherwin Ganga, the offspinner, bowled three overs in the Powerplay. The third ball of the game perhaps indicated which team was suffering more from the yips. Warner opted to play a weak reverse sweep and nearly edged it back to the bowler. Warner did go on to thread a couple of boundaries on the off side but never looked in. Meanwhile the pressure told on his partner Phillip Hughes, who faced three balls in the first three overs, and fell, trying to slog-pull the impressive Ravi Rampaul. While Sherwin Ganga was miserly, it was Rampaul who really shone with a fine display of canny seam bowling. He hit a full length, got the ball to cut both ways and built pressure. One moment captured his combative spirit perfectly: When Warner tried to impose himself with a crashing cover-drive, Rampaul fired in a sharp 140 kmph bouncer that flew past the startled batsman. The chance for NSW to break free came in the fifth over bowled by Dwayne Bravo, who had leaked runs in the semi-final. Katich started off with a bottom-hand powered six over long-on but Warner fell in the same over, edging one to right of backward point where Dave Mohammed took a fine catch. What followed was a nervy phase for NSW as one batsman after another fell to soft dismissals. Katich punched Bravo straight to mid-off, Moises Henriques swung a short delivery to fine-leg, Ben Rohrer pulled a long hop straight to deep midwicket, and Daniel Smith chopped a length delivery back on to his stumps. But Lee and Smith saved the day with some sensible batting and pushed NSW to a competitive score. Trinidad and Tobago defeated South Africa's Cape Cobras by 7 wickets to enter the finals of Airtel Champions League T20. With this victory, Trinidad and Tobago have acquired the license to meet Australia's New South Wales in the finals. Earlier, Puttick of Cape Cobras won the toss and elected to bat first. Herschelle Gibbs started the innings in an explosive manner - as he went on to score 42 off just 27 balls with 5 fours and 1 six. After Gibbs' departure, J P Duminy took charge for Cobras in his typical fashion and scored a blistering 61 off just 40 balls with 4 fours and 3 huge sixes. Cobras eventually finished their innings on 175. They could have scored more, if Ravi Rampaul haven't bowl that super last over, where he conceded just 2 runs. For T&T, Lendl Simmons took 2-17. In reply, every batsman of Trinidad and Tobago got good starts; be it Perkins, Barath or Simmons. But the real blow came from Darren Ganga and Dwayne Bravo, who took Trinidad and Tobago with lusty blows. They managed to took Trinidad and Tobago from a feeble position to victory. Barath scored 29 off 16 with 4 fours and 2 sixes, Perkins scored 20 off 16 with 4 fours. The real heroes Ganga and Bravo scored heavily, as Ganga finished on an unbeaten 44 off 31 deliveries with just 1 four and 2 sixes, whereas Bravo was more severe on Cape Cobras' bowlers, as he scored an unbeaten 58 off just 34 balls with 4 fours and 3 huge sixes. Justin Ontong and J P Duminy took 1 wicket each. Undoubtedly, Bravo was declared the Man of the Match. Now, we have a great finals between tournament's top 2 teams. This clash is really a justified one as both the teams have been simply outstanding in the entire Airtel Champions League. If I talk about my favourites, it had to be Trinidad and Tobago. NSW crushed another Australian team Victoria Bushrangers by 79 runs to enter the finals of Airtel Champions League T20. 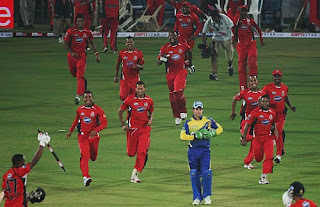 They will meet the winners of the match between Cape Cobras and Trinidad and Tobago. NSW's Captain Simon Katich won the toss and elected to bat first. The top order of New South Wales proved his decision was right, as David Warner thrashed the Bushrangers' bowlers all over the park and scored 48 runs off just 25 balls with 7 fours and 2 huge sixes. Along with Phil Hughes, Warner added 62 runs for the first wicket in just 6.5 overs. Even after Warner's dismissal, NSW batsmen added quick runs and ensured that NSW get close to 170. 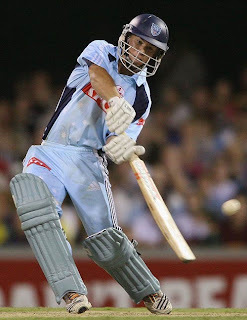 For New South Wales, the main scorers apart from David Warner were Phil Hughes (35 runs 28 balls 4 fours 1 six), D Smith (20 runs 19 balls 3 fours), captain Simon Katich (26 runs 18 balls 2 fours 1 six) and B Rohrer (19 runs 11 balls 2 fours). NSW ended their innings at 169-7 in 20 overs. In reply, Victoria Bushrangers started off disastrously, as both their openers, Rob Quiney and Brad Hodge got out for 0. Soon, they were reduced to 6-3, as off spinner Nathan Hauritz (who opened the bowling with Brett Lee) dismissed the openers and A Blizzard was dismissed by Brett Lee. The fate of the match was already decided after the fall of these three wickets. Victoria Bushrangers managed to score just 90 off their 20 overs. For New South Wales, Brett Lee and Nathan Hauritz took 2 wickets each, but the leading wicket taker was Moises Henriques, who took 3 for just 11 runs off his 3 wickets. Wade was the highest scorer for Bushrangers, as he scored 23 off 29 balls. David Warner was adjudged Man of the Match for his splendid batting. Delhi Daredevils - under new skipper Gautam Gambhir - were beaten by Victoria Bushrangers. For Victoria Bushrangers, Clint McKay led a devastating seam attack, in the opening match of Group D.
Delhi was looking like strangers against a bowling attack that was ruthless on a pitch with consistently uneven bounce, because of which run-scoring was quite a problem. Gambhir would not have thought for such a poor performance after selecting to bat after winning the toss. Delhi just managed to leave behind the second lowest T20 score at this ground, registered by the Eagles, earlier in the day. Virender Sehwag attempted to stamp his authority in front of home crowd by smashing boundaries off successive Shane Harwood balls, but was splendidly caught & bowled by Clint McKay in his 1st over off a mistimed shot on the leg side. Clint McKay followed it up by getting English batsman Owais Shah, caught behind for naught. The troubled situation forced Dilshan to play the sheet anchor role & he was conscious, when Clint McKay - who enjoyed the seaming conditions -bowled him. Middle order batsman Mithun Manhas made 25. Andrew McDonald dismissed Rajat Bhatia and Pradeep Sangwan in the last over. In reply, Rob Quinney of Bushrangers, didn't let anyone feel that the pitch is not suitable for good batting. Dirk Nannes and Ashish Nehra disappointed and the scoring for Bushrangers for free flow. With 32 already on the score board in the 5th over, Daredevils were in a state of panic. Leg Spinner Amit Mishra was also sent for a six and a four, but he managed to dismiss Rob Quinney on the last bowl of his first over. Brad Hodge, who was a mere spectator from the other end, was bowled by Tilakaratne Dilshan 2 balls later, but with Victoria racing to 55-2 in the 9th over, Daredevils needed a miracle. Dilshan and Mishra, managed to slow the scoring rate, but Bushrangers, having been delivered a superb start, could afford to relax. Rajat Bhatia took the wicket of David Hussey with a slower delivery, but it was too late for the Daredevils. Blizzard won the game for Victoria, smashing Bhatia for a big one over long-on. Mcckay was the lone choice for the Man of the Match award. Cape Cobras (of South Africa) defeated Royal Challengers Bangalore in an exciting finish with the help of a brilliant 99 not out by J P Duminy. J P Duminy scored these runs in just 52 balls. He played every shot in the book and remained unbeaten on 99, as he took a single to tie the score on the third ball off the final over of the match bowled by R Vinay Kumar of Royal Challengers Bangalore. Anil Kumble of Royal Challengers Bangalore won the toss and elected to field first. Royal Challengers Bangalore opener Robin Uthappa played a superb knock of 51 off just 39 balls, when he got out on the bowling of Mondi Zondeki. Earlier, Royal Challengers Bangalore lost the opener Jacques Kallis pretty early. Royal Challengers Bangalore batsman Ross Taylor also hit a fast half century and remained unbeaten on 53. For Cape Cobras, Charles Langeveldt took 1 wicket, but he conceded only 12 runs off his 3 overs. Other major wicket takers for Cape Cobras were Mondi Zondeki, and Henderson. In reply, Cape Cobras had a pretty decent start, but they seemed to lost the way after the loss of a couple of wickets. However, Jean Paul Duminy stood tall and scored an unbeaten 99 off just 52 balls with the help of 8 fours and 5 towering sixes. Along with Canning, he scored 61 runs for the 5th wicket. J P Duminy hit 3 boundaries and 1 six in the tense stage of the game. Praveen Kumar of Royal Challengers Bangalore bowled reasonably well, until he was hit for 2 boundaries by J P Duminy in the penultimate over of the match. For Royal Challengers Bangalore, Praveen Kumar took 3 wickets, whereas spinners Anil Kumble and Roelef Van der Merwe took 1 wicket each. 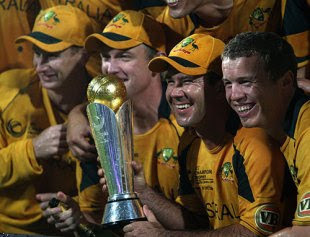 Australia defeated New Zealand to won the ICC Champions Trophy 2009 by 6 wickets. New Zealand batted first and managed to score just 200. Australia, however struggling a lot in the early overs, win the game comfortably in the end, thanks mainly to the second successive century by opener Shane Watson and a gritty half century by Cameron White. 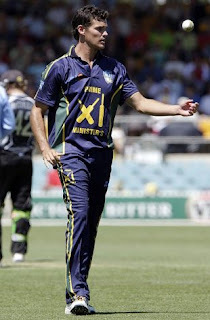 Shane Watson was declared the Man of the Match, whereas Australian captain Ricky Ponting was declared the Man of the Series. Australia defeated Pakistan on the very last ball of the match and managed to book a place in semi finals of the ICC Champions Trophy 2009. With Australia’s victory, India will be booking a ticket after the India-West Indies match. However, India won the game against West Indies (see below for details), but it was too late for the World’s Number 3 team in the world. Just like the New Zealand-England game, it was a do-or-die game. However, it was Australia who was not at a great danger. Well, Pakistan, put on to bat first by Australia, as Ricky Ponting won the toss for Australia. It was a good wicket to bowl on, and with perfect conditions for seamers, Pakistani batsmen found it difficult to cope with the conditions. It was evident from Pakistani skipper Younis Khan’s innings, as he scored just 18 from 49 balls. Can’t say, was that a deliberate attempt from the Pakistanis to play slowly (in order to minimize Indian chances) or were the conditions really helpful for the seamers? Well, they finished off on just 205 and put Australia a really easy target. Australians started off well and it looked like an easy Australian victory, before struggling at the doors of victory. Pakistani spinners turn the tables and suddenly Australian middle and lower order looked fragile. It was Brett Lee, who kept his nerves and ensured that Australia doesn’t have for the India-West Indies match. Meanwhile, India wins the game against a weak West Indies side by 7 wickets, but it was too late for them. The Indian pacers started off brilliantly, plucking West Indian wickets like flowers, as Pravin Kumar and Ashish Nehra did a fantastic job and shared 7 wickets between them. However, they have done it very late and had it would been India-Pakistan tie, there performance should have been heavily praised by crores of Indian fans. Virat Kohli was declared the Man of the Match, for his unbeaten 70 runs in the chase. New Zealand registered a difficult win against England to move ahead to the Semi Finals of the ICC Champions Trophy and to stop Sri Lanka from qualifying with the same. England batting first, had a disastrous start as they lost the top 3 batsmen with just 13 on the board. Paul Collingwood and Ravi Bopara tried hard to provide stability to the innings but other batsmen failed to do so. Ryan Sidebottom also played an important innings of 20 in the end to take England close to 150. Surprisingly, Grant Elliot was the highest wicket taker with figures of 4-31 and Shane Bond contributed with figures of 3-21.